Members of the Little Flower High School swim team, from left, pose with their District 12 championship plaque: Rose Pisacano, Catherine Spreckly, Rachael Wisniewski, Sarah Coleman and Emma Coyle. When the Catholic League swimming season began, few people considered Little Flower as a legitimate contender to snare a championship. Actually, “few” might be putting it too nicely. Not a single Sentinel claimed to have believed before the season that Little Flower would ultimately be the last team standing against the likes of favored Archbishop Ryan and Archbishop Wood. However, Little Flower’s 15-year coach Sean Clothier had allowed himself to bask in the reverie of a possible title, albeit with a reminder to remain realistic about such a fantasy coming to fruition. Lo and behold, just about every Little Flower starter ended up contributing a career-best performance. And so, on the weekend of Feb. 14-15 at Widener University, the Sentinels of Little Flower were crowned the Catholic League champions. As he and his athletes celebrated the program’s first-ever title, Clothier reminisced about previous hardships, especially the 2004 season in which the Little Flower roster consisted of only six swimmers – numbers low enough to seriously threaten the existence of future endeavors. Senior Sarah Coleman, an All-Catholic whose last race – a 50-yard freestyle in Little Flower’s one-point district championship victory over Archbishop Ryan – established the Sentinels’ ninth team record this winter, understood her coach’s sentiments. “Winning the Catholic League championship has always been a dream for Little Flower swimming,” Coleman said. “Our team has come such a long way, and being a part of the team when we finally achieved this is something I’ll never forget. Coleman was one of several Little Flower swimmers who participated in the state championships last week. 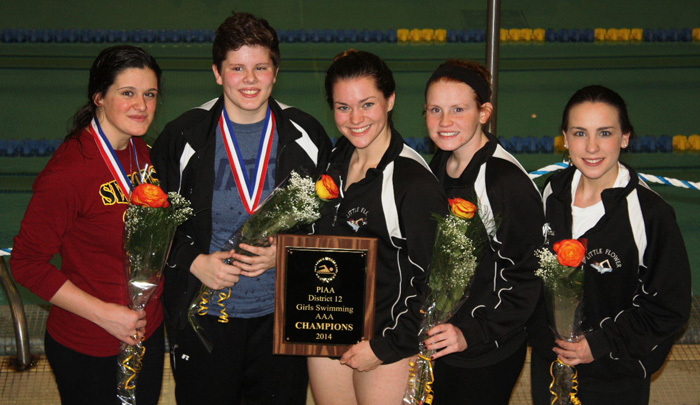 A graduate of Resurrection of Our Lord School and currently a member of St. Albert the Great Parish in Huntingdon Valley, Coleman was particularly moved by her team’s collective achievements because her two sisters, 2013 graduate Caitlyn and 2010 alumna Lauren, are former Little Flower swimmers. Like her sister Caitlyn, Coleman was a team captain, joining Emma Coyle and Catherine Spreckley. Those three, along with All-Catholic Rose Pisicano and Rachel Wisniewski, are the only seniors among Little Flower’s 21-woman roster. Clothier, a 1996 Father Judge graduate, labeled Coleman as “literally the hardest working swimmer I have ever seen,” and said that proved critical to Little Flower’s triumph. As the season progressed, so did Clothier’s confidence. The aforementioned Coyle, a product of since-closed St. William School, said she didn’t think about a potential title until the midway point of the season. When she noticed that Ryan had defeated Archbishop Wood by fewer points than what Little Flower had won by, Coyle started to re-think the possibilities. “I’ve been part of this for four years,” Coyle said. “We have a small team and no one expected this. As the meet drew to a close, Coyle was one of several Sentinels in the warm-down pool. It was there she learned that all of that four-year effort had proven to be more than worth it.